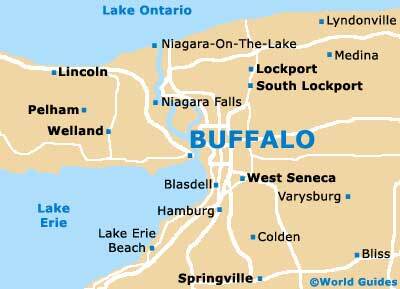 Buffalo is known for being the home of the spicy chicken wing and gateway to Niagara Falls (American side). Sitting commandingly at the top end of Lake Erie in upstate New York (NY), the city of Buffalo is separated from Canada by the Niagara River. Buffalo is the second-largest city in New York state and is located around 70 miles / 112 km to the west of Rochester and around 390 miles / 627 km from New York City. Known for its wealth and high concentration of millionaires, Buffalo city is also famous for its numerous Art Deco buildings, which are clustered in downtown Buffalo, alongside glass-fronted skyscrapers. 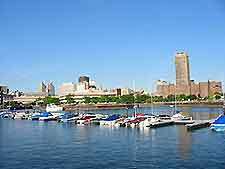 Standing next to Lake Erie, Buffalo features a number of marina areas and waterfront hotels. Accommodation can be found throughout the city, particularly in and around Buffalo city center, the Buffalo Theater District, the Allentown district and throughout North Buffalo, close to Delaware Park. A selection of hotels are also situated close to the nearby Buffalo Niagara International Airport (BUF). More information about Buffalo Hotels. Much of Buffalo has been renovated over the past few years and the city is regaining its earlier historic charm. The City Hall is perhaps the most famous building in Buffalo, which dominates the skyline and features classical architecture, dating back to the early 1930s. Many excellent restaurants are situated around Buffalo's Chippewa Street, Main Street and Delaware Avenue, together with bars, cafés, shops, theaters and nightclubs. Tourism has become an important part of Buffalo's economy and the main tourist information center is the Buffalo Niagara Visitor Center at the Market Arcade on Main Street. Here you will find a weather of tourism information, such as leaflets, magazines, maps, travel timetables and general information about Buffalo's many tourist attractions, both natural and manmade. Weather in Buffalo is known for its distinct seasons, with hot summers and cold winters. Snowfalls in the winter months can be heavy, adding a certain charm to the city and surrounding countryside. Buffalo's peak tourist season is during the summer, mainly between June and August, although many people choose to visit Buffalo city in the spring and autumn, when it is still warm, but less crowded. Buffalo contains an array of popular tourist attractions, including the Buffalo Zoological Gardens - one of the oldest zoos in the whole of America, housing over 1,000 species of animal; Darwin D. Martin House - a renowned house designed by well-known architect Frank Lloyd Wright in the early 20th century; Graycliff - located on a cliff next to Lake Erie, a notable building offering magnificent views; St. Paul's Episcopal Cathedral - one of Buffalo's oldest buildings, with imposing architecture; Rock City - to the south of Buffalo, featuring many hiking trails and superb quartz rocks; Theodore Roosevelt National Historic Site - appealing to history buffs, where Roosevelt was inaugurated as president in 1901; and Niagara Falls - one of the world's most breathtaking natural sights, just a short trip from Buffalo. 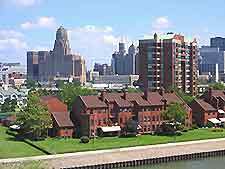 More information about Buffalo Tourist Attractions and Buffalo Landmarks. Some of the main museums and art galleries in the Buffalo area include the Albright Knox Art Gallery - Buffalo's premier art gallery, with many masterpieces painted by world-famous artists, such as Picasso; the Buffalo and Erie County Naval and Military Park - a popular museum containing a large historic submarine, a missile cruiser and military information; and the nearby Herschell Carrousel Factory Museum - the only historic carrousel factory in the whole of the USA, with two working antique rides. 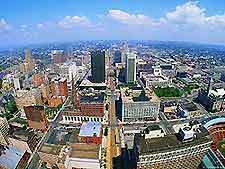 More information about Buffalo Museums and Art Galleries.